If you’ve ever been to a Korean BBQ restaurant, you’ll remember this cut of meat, and remember it fondly. If flaken style ribs were an 80’s supermodel, they’d be Jill Goodacre: not everybody knows about them, but they’re really damned awesome (and married to Harry Connick, Jr?). Sorry for the tortured metaphor. My original plan was to do a kalbi with these, but that would have required an additional trip to the grocery store. 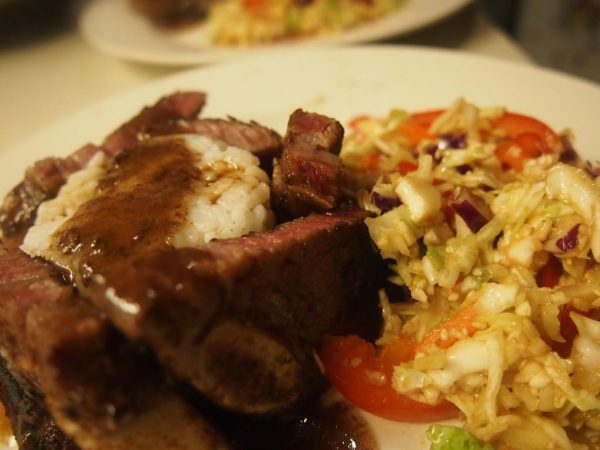 Luckly, my wife had made a really awesome teriyaki sauce the previous week and we had some leftover. Less work for me, and I already knew it was a great marinade. I did a quick survey of other sous vide recipes of flaken ribs, and determined that 24 hours would be a good target. A little prep work, and we were under way. The results were a total win: the dish was delicious. I’d never used the flaken cut of the short ribs before, and I was really impressed. Very flavorful, and with a nice slow cook, a great texture. I’ll definitely be playing with this cut again. Preheat a water bath to 137ºF. Combine the mirin and sake in a small saucepan. Heat over medium-low for 5 minutes, then add the soy sauce and sugar. Stir until dissolved. Adjust the heat to simmer for 20 to 25 minutes, until reduced by about a third and thickened. There should be a very generous 1/2 cup. Set aside to cool and concentrate. Combine 1/4 cup marinade and short ribs in a food safe vacuum bag, and seal. Submerge the bag in the water bath, and cook for 1 to 1.5 days. Serve with rice and an asian-style slaw. The marinade can be cooled and stored in the refrigerator for up to a week. A lot of people list 48 hours for short ribs, but I think that would be too long for the flaken cut. A 24 hour soak yielded a great texture and hadn't overly "broken down" yet.